With a sixth floor room it was blissful to leave the blinds alone and leave that beautiful picture window as it was when I went to bed with a storm raging outside. So I wasn't too surprised to be woken by the moon glowing outside my window at exactly 5:22am according to the bedside clock. Feeling slightly crazy I threw on my big red Zumba beach top and headed across the street to the still dark beach. Wondering if I would be murdered, I felt much better as several early morning joggers flew past. Down at the dark water's edge the sound of the water lapping, together with the power of the full moon was intense. Then I heard the singing. A small group of people were singing in a language I didn't recognise. Maybe native American, they were wading in the water and carrying large sticks – perhaps to ward off sting rays or jellyfish. As the moon dropped lower and lower, in a way that the moon just doesn't do in England, it was suddenly hit by the first rays of the sun, and the water turned gold. The people started to swim in the golden water, laughing and smiling. It felt so special that I couldn't join in, or even ask them, or the few men waiting by the lifeguard station what exactly was happening – it just seemed to me a very sacred healing ritual. I was also shedding a few tears as the old story of the two lovers torn apart by magic that turned them into the Sun and Moon, destined only ever to see each other for a few moments at sunrise, was haunting me. I walked away, and headed to my hotel and the dock behind the pool to watch sunrise, which was also mesmerising. The next day I went down to the beach but the people weren't there. I still bathed in the water in the first light of day and it was heavenly, but it wasn't the same. Everywhere I went I asked if anyone knew what it was all about, even at the Miccosukee Village, but no one knew. Even Google doesn't know. 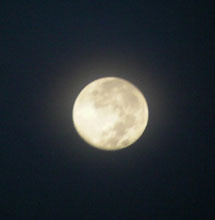 So I'll keep asking, gently, but for now I'm happy to leave it as a moon mystery and wonder if I'll ever see it again. For more on native American healing see Everglades/Big Cypress and also my Guide To Treatments.